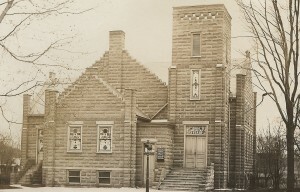 Eventually, the one-room brick building proved to be inadequate to meet the needs of the congregation, so July 4, 1904, it was demolished to make way for a new structure. Men, women and children of the church attached ropes to the walls and pulled them down. They then collected and cleaned the bricks to be used in their new building. The total cost of the second building (pictured on the right) in 1904 was $7,314.12. While it was being constructed, services were held in an empty church building at the site in Wakarusa known as Bunker Hill. Interestingly, this same site is now the backyard of the residence of the current Senior Pastor, David Harper. 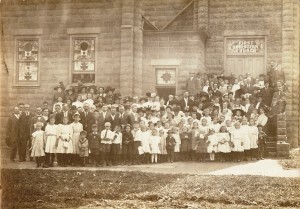 A new structure which continues to serve as part of the church, was officially dedicated March 14, 1937. Additions to this building were finished in 1959, 1968, and 1996. After an expansion of the facility in 1930, tragedy struck when a fire destroyed the building on June 23, 1936. The damage was so extensive all that remained were the cement walls. Only three chairs and the pulpit were saved. In 1945, the First Christian Church broke away from the Eel River conference to become an independent Bible Church. Then on July 1, 1970 the name of the church was changed to Bible Baptist.